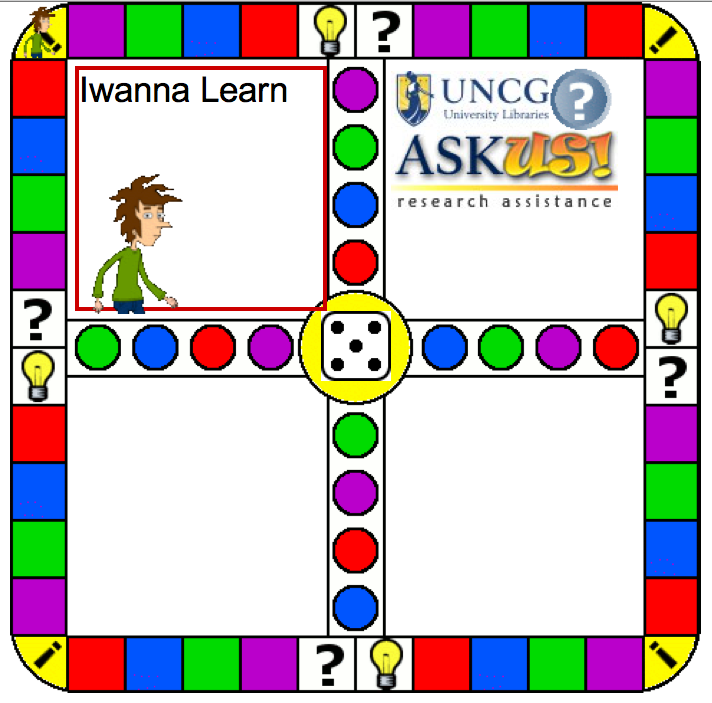 The Information Literacy Game from the University of North Carolina Greensboro is a flash-based or printable board game for 1-4 players. Trivia questions focus on four categories: Searching/Using Databases, Cite Your Sources/Avoid Plagiarism, Library Wild Card and Choose Your Resource. Possible classroom uses: a “fun” homework assignment or if focusing on information literacy, students could play it head-to-head as a review of content. After a quick registration, I was ready to play! And I was impressed. 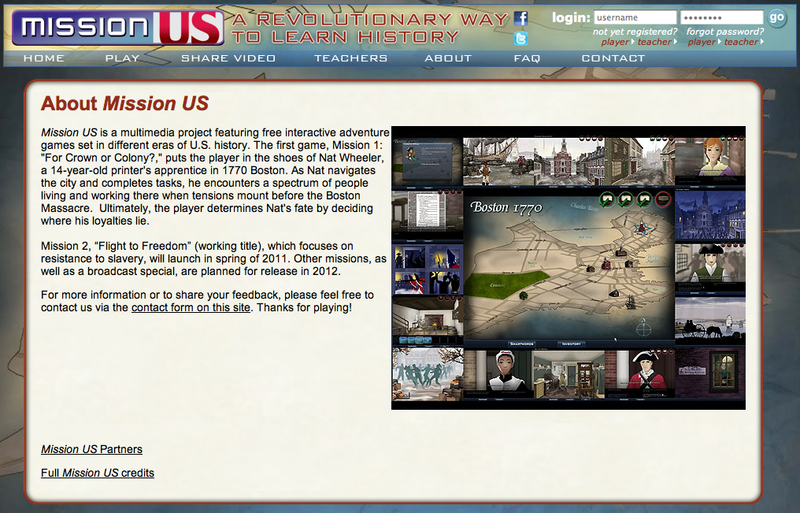 Mission 1 of Mission US, “For Crown or Colony,” is a 5-part multimedia game with a solid flash introduction to the setting of the Revolution. The “game” “puts the player in the shoes of Nat Wheeler, a 14-year-old printer’s apprentice in 1770 Boston. As Nat navigates the city and completes tasks, he encounters a spectrum of people living and working there when tensions mount before the Boston Massacre. Ultimately, the player determines Nat’s fate by deciding where his loyalties lie.” I really wish I taught US History again. Including historical background on the time period as well as game characters for teachers, a primary source collection focusing on pertinent documents from the Revolutionary period and more, this is a great activity for learners, especially grades 7-10. There is also a version of the game available for download which would help with bandwidth issues. Impressive financial backing from the National Endowment for the Humanities and the Corporation for Public Broadcasting. I look forward to the near future as it looks like any day now there should be a rollout of a second mission, focusing on resistance to slavery. One of the things I enjoy when teaching the Classroom Technology course for Saint Mary’s is learning from our learners. This past Monday, one of our learners introduced me to SPENT. The Urban Ministries of Durham, NC, designed an interactive role-play experience to challenge the way people think about poverty and homelessness. For 30 digital days, the “player” is put in the position of a person living in poverty. Select a job and make “real-life decisions” such as where to live, whether to take time off of work to attend the wedding of a friend, or what to purchase when grocery shopping. Each decision has financial implications and statistics are given throughout the game to help educate about the realities of the poor and homeless. This interactive simulation would be excellent in a class that focuses on life choices, personal economics, sociology, or in any content or programming which focuses on the issues of homelessness and poverty. This Friday Five is dedicated to an important cause, food safety. (I was reminded of its importance late last week, I wish the restaurant that made the Santa Fe Chicken Sandwich I ordered investigated some of these resources. Perhaps I would have been able to blog sooner this week! :P) But I digress. Every FACS/food class and many health classes focus on food safety and food preparation safety. These free resources could easily come in handy either as individual assignments to explore, or in some cases, as resources to share and explore collectively. Number 1: From Canada, this CBC Marketplace place resource has an interactive investigation of a coffee shop and key points to food prep safety consumers can watch for in any fast food place. This interactive also has links to additional resources about food poisoning, news reports, and eighteen more pieces on food safety, some with videos. Number 2: Food Safety Mobile Game from the USDA. The USDA’s flash game has safety tips and questions on how to handle food safely with a focus on fighting “BAC” (bacteria). The Food Safety Mobile Game would be great for elementary and younger middle s chool-aged students, though a high school student might enjoy it too (if no-one is looking). 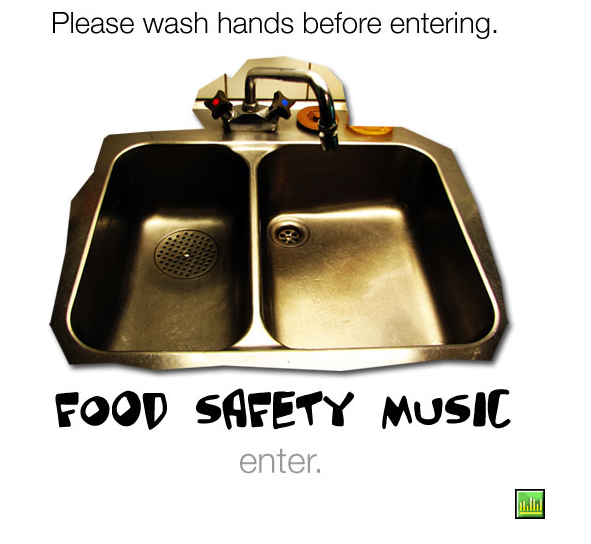 Number 3 (probably my favorite): Food Safety Music from the University of California. 27 “downloadable” songs parody mainstream songs and all focus on food safety. The songs also have PowerPoint slide presentations with accompanying lyrics and clip-art, lyric files, Flash animations and in some cases concert footage. Pretty fun, really, check it out! Number 4: Food Hygiene Mission Control, an interactive series of quizzes, games and information aimed at young people ages 7-14 and their teachers/parents. The teacher resources includes two printable activities, a glossary, and links to more resources. Number 5: From the American Museum of Natural History, the interactive “magazine” Infection Protection Detection. 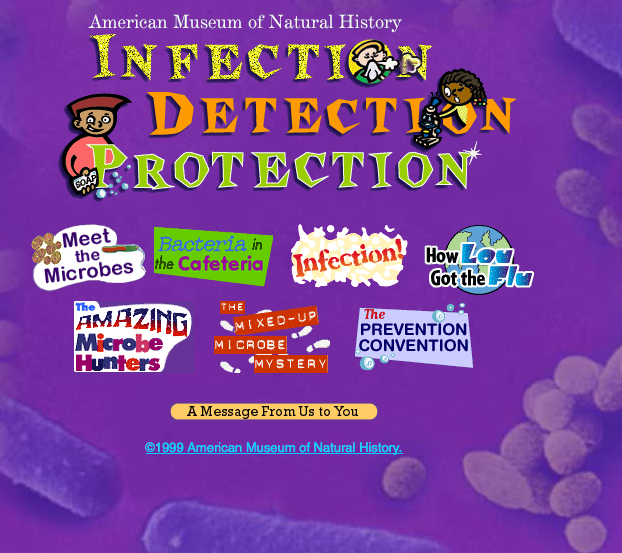 With articles, a game on cafeteria bacteria, an introduction to scientists in this field, links to related content on the web and more, the American Museum of Natural History created a user-friendly resource for students through at least grade 8. And just for good measure, number 6: Curriculum on food safety for all grade levels. For K-3, a script for a skit on food safety, ideas for storytelling and other lessons focusing on food safety. For grades 4-8, experiments, games and activities focusing on fighting bacteria and food illnesses. And for grades 9-12, a link to the USDA’s food safety program for high school students including a free curriculum kit with video, teachers guide and lessons for the classroom.